How do I set up multi-factor authentication for my user account as a student? Your institution may enable multi-factor authentication for your user account. Multi-factor authentication adds security to your account by verifying you are the user accessing your account. Multi-factor authentication may be optional or required. You must have a mobile device to set up multi-factor authentication for your user account. Your device must be able to send text (SMS) messages, or if you have a smartphone, you can download the Google Authenticator app for iPhone or Android. 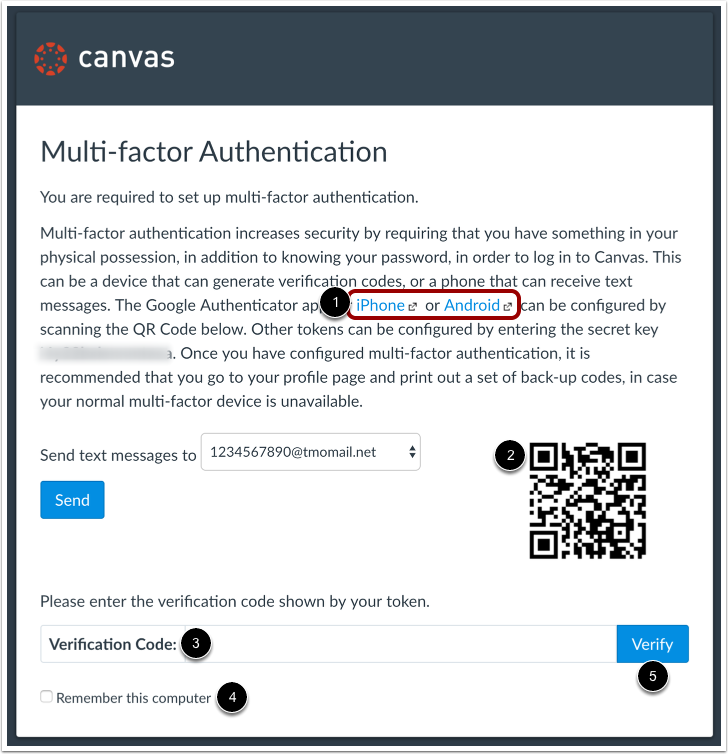 Note: This lesson shows how to set up multi-factor authentication if it is an optional setting in your user account. 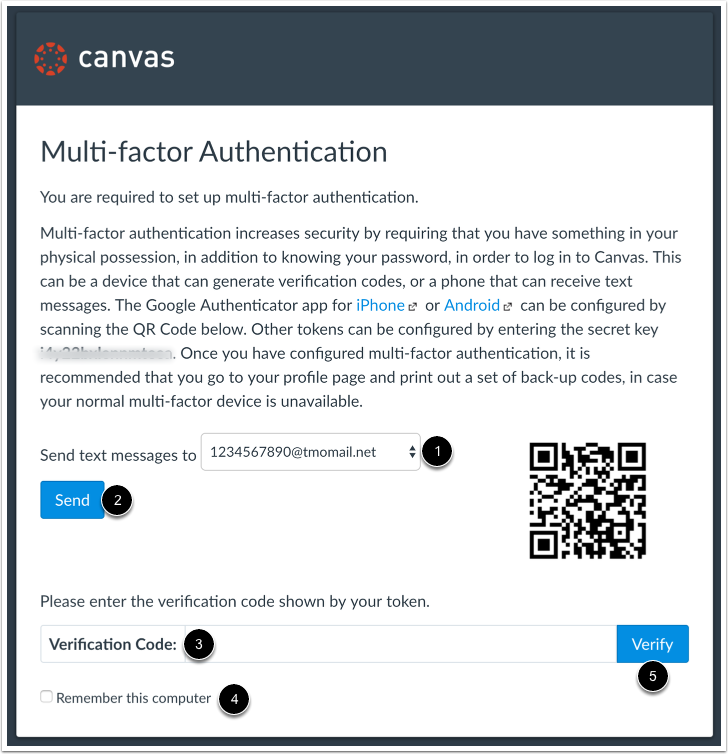 However, if multi-factor authentication is required by your institution, you will be shown the multi-factor authentication page directly after you log in to Canvas. In Global Navigation, click the Account link , then click the Settings link . Click the Set Up Multi-Factor Authentication button. To verify multi-factor authentication with Google Authenticator, download the app for your device (iPhone or Android) . Use the app to scan the QR code and generate a code. Enter the code in the Verification Code field . If you want multi-factor authentication to remember the computer you are using to log in to Canvas, click the Remember this computer checkbox . Click the Verify button . To verify multi-factor authentication via text message, any existing SMS notification type displays in the drop-down menu . This is the number where your multi-factor verification code will be sent. To select a new text (SMS) number, select the drop-down menu and enter the option to add a new phone number. You will need to know the phone number and mobile carrier (provider). Once you have set up your new phone number, or selected an existing phone number, click the Send button . Your mobile device will receive a verification code. Enter the code in the Verification Code field . Once multi-factor authentication is enabled, your User Settings page may display additional options to manage your authentication. 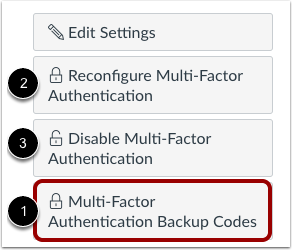 You can choose to create multi-factor authentication codes to use as backup in case your authentication device is not available . This option is available to all users with multi-factor authentication. If multi-factor authentication is optional for your account, you can also choose to reconfigure authentication  or disable authentication . 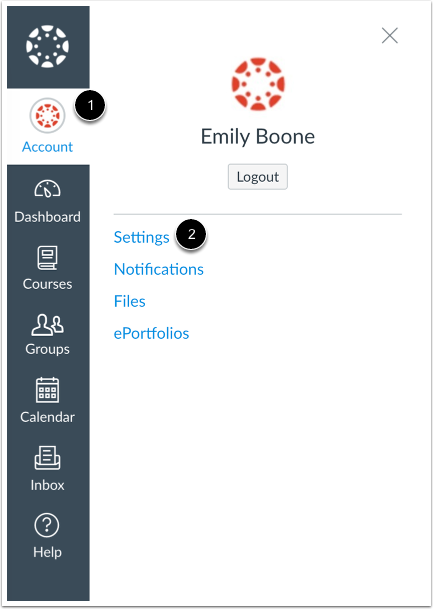 Previous Topic:How do I add a text (SMS) contact method in Canvas as a student? Next Topic:How do I manage API access tokens as a student? Table of Contents > Profile and User Settings > How do I set up multi-factor authentication for my user account as a student?